What is Different in Gemini? Yahoo Gemini is Oath’s advertising marketplace. It allows you to create premium branded content and deliver search and native advertising campaigns. Yahoo Gemini boasts 2 billion daily ad impressions, 1 billion active monthly users, and 165 billion daily search intent signals. This marketplace is where you syndicate content on Yahoo and AOL properties such as Yahoo Search powered by Bing, TechCrunch, AOL, Tumblr, and HuffPost. Gemini encompasses desktop and mobile Yahoo and AOL properties, search, and apps like Yahoo Sports or other third-party apps partnered with Oath. 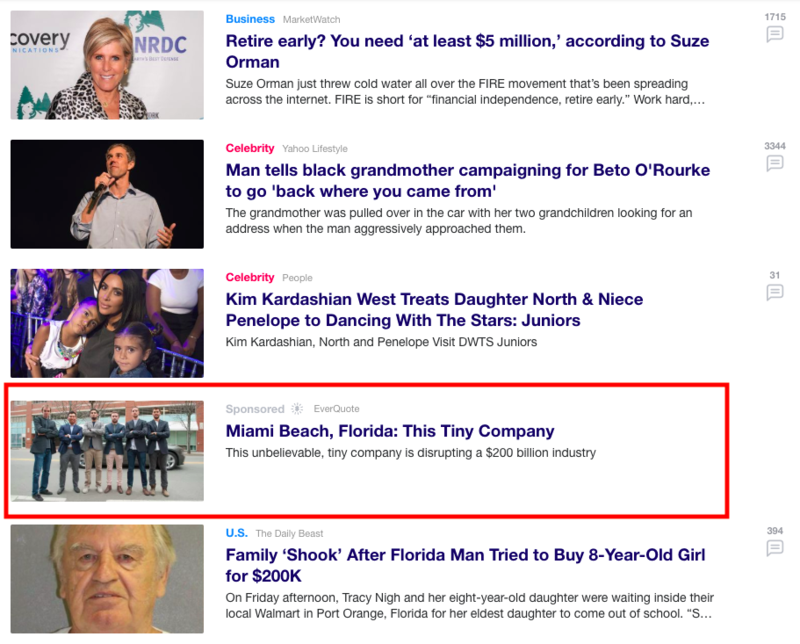 Gemini has numerous options for targeting that make it very appealing to native ad buying. Easier targeting for age ranges and gender help to better target your audiences. Gemini also works with platforms differently than other networks. You bid based on publisher groups, which target certain devices and properties based on the group type. Generally A groups are desktop while B groups are mobile. These publisher group adjustments are modified on the final step of campaign creation. Click here for more information about the bid adjustment groups. You can not remove bidding on publisher groups, only bid the lowest possible amount for that group. Gemini also includes Carousel and Video ads which allow for additional types of ads to reach your audience. Gemini handles Day Parting CPC windows differently than other networks. Click here to read more about Day Parting with Gemini. During campaign creation there are Gemini specific options and settings available in Maximus. To learn more about these features click here for the Creating Ads documentation. During the Content step of campaign creation, you must enter a display URL. This display URL should be user friendly and easy to read. All images to add to a Gemini campaign must be 1200x627 pixels in size. In addition to the 1200x627 rectangular image, Gemini also uses a 627x627px square image. This is because different images are shown when viewing the ad on mobile, tablet, and desktop platforms. After adding an image in Maximus your rectangular image must be cropped to the 627x627 square image. Upon submission of the ad, both versions of the image are sent to Gemini. Call to Action text is optional, and is text that will be displayed on a call to action button. You cannot use animated gifs due to Gemini's API restrictions. Gemini Carousel Ads allow for more than one image to appear in the ad - so you can emphasize or advertise different text and images in the same spot. In this example the carousel ads have different messages, grabbing the user's attention and can lead to driving more clicks. Our How To guide for carousel ads can be found by clicking here. Gemini Video ads are designed to not interrupt the user when browsing. Videos autoplay whenever possible and default to being on mute. Generally, users click a video to expand the view and turn on the sound. Click here to read Yahoo's official page on video ads. Our How To guide for video ads can be found by clicking here. There is a final step added to campaign setup which allows you to select Age Targeting, Gender Targeting, and Gemini Bid Adjustments. Fire & Forget™ Optimization can select one of the publisher groups to apply Fire & Forget™ optimizations to. To learn more about these targeting settings click here. Maximus allows users to add and view Gemini Email Audiences, targeting segments that use a CSV list of email addresses to target specific users. The audiences for these targeting segments are based on the email addresses you provide and are available for specific sub accounts you choose to add them to. Your campaigns will only be seen by those users who have logged in under that email address when viewing ads. Click here to learn more about Gemini Audiences. When setting site bids for Gemini, site bids must be maintained within the range of -80% (Min) up to 800% (Max) of the campaign CPC value. Click here to learn more about Gemini Site Bidding. In the Campaign Details page there is a section for the Gemini Bid Modifier, which displays a table report of the bids made organized by publisher group. Gemini offers additional targeting which can be done outside of Maximus. If a setting can be changed in Maximus, do not change it on the network. In Gemini you can do Custom Audience Targeting, Location Targeting, and Interest Targeting. Click here to view our network targeting outside of Maximus documentation.